Razer is now officially taking preorders on its dedicated gaming laptop, the Razer Blade, just in time for Christmas. CEO of Razer Min-Liang Tan explains everything that has changed since the “world’s first true gaming laptop” was unveiled back in August and also talks about the Army origins of the sleek and stylish design of the laptop. If you’re lucky, this gaming rig could be in your stocking before Santa has time to finish off those cookies and milk. This type of rapid deployment is expected from something modeled after the Army’s fastest and most reliable weapon, the KA-BAR combat knife. The comparisons between the knife and the laptop are chilling. The color is similar, the spines line up perfectly, the vents on the underside of the Razer Blade are edged in silver like the edge of the knife and the system start-up sound is even inspired by the sound of the knife being pulled across a whetstone. The price of the device hasn’t dropped any since its unveiling, staying at a rather expensive $2,799.99. However, Razer has managed to pack at least one major upgrade into the device without increasing the price. The upgrade comes in the form of replacing the previously mentioned 320GB hard-disk drive (HDD) with a 256 solid-state drive (SSD). Sure, the space is decreased, but the performance difference more than makes up for it. Shipments of the Razer Blade have already started to select Razer friends and game publishing CEOs with the rest of the world to see their devices shipped in the next couple of days, just in time for Christmas. 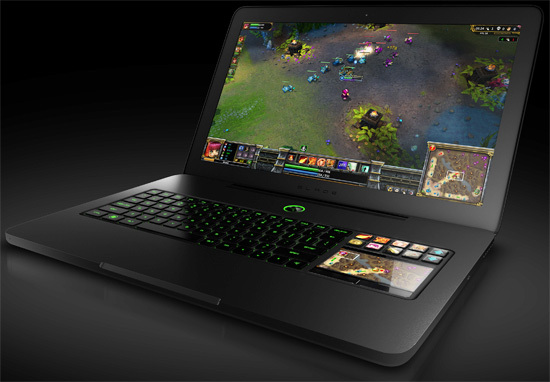 You can check out all the details about the Razer Blade ultimate gaming laptop on Razer’s website. Hafing read this I thought it was extremely enlightening.